Content isn't 'stuff we write to rank higher' or 'infographics' or 'long-form articles.' Content is anything that communicates a message to the audience. Anything. — Ian Lurie, CEO, Portent, Inc. It is believed that content is the heart of what marketers do; they talk to customers, their clients, and their readers, and what they say to them—regardless of what form it takes—is their content. 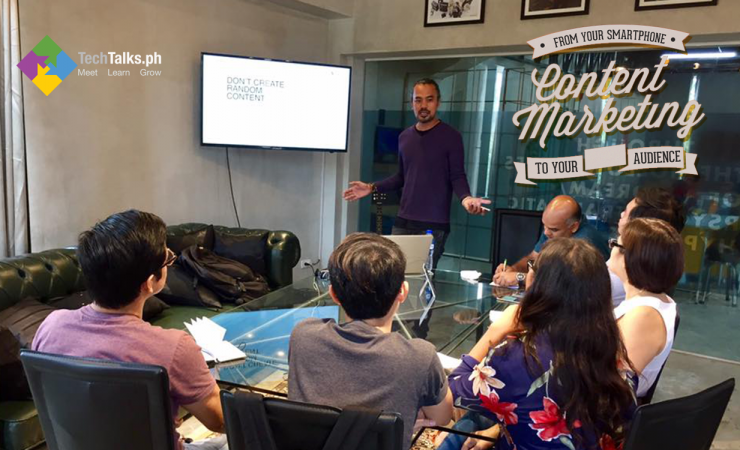 On May 13, 2017, TechTalks.ph organized the Content Marketing from Your Smartphone to Your Audience Workshop with Facebook Marketing - Case Study Walkthrough at A Space Cebu from 9 AM - 1 PM. In every marketing strategy, content can be the most expensive if one doesn’t have graphic designers, video editors and copywriters. But this could be very expensive for a business that is why the workshop highlighted ways to build own content without spending tons of money, how to have a definitive purpose, how to set reachable goals and how to have a flair for things that look good. The workshop also explained how to craft own content based on what the market demands, how to write micro-stories, build series from these micro-stories and use content that can engage the audience. It also discussed some practical steps in coming up with a concept, designing from that concept and distributing it to the media in the form of stories. Robert Cristobal was the resource speaker for the seminar. He is an international digital marketing consultant who’s worked with SMEs and MNCs in Singapore, SE region and the Philippines. He is also the Chief Content Officer of TechTalks.ph, Founder and Creative Storyteller of Frame 316 (Singapore) and Head of Content of BAM Agency Hub (Singapore). Does your business need content marketing strategy? Contact us at info@techtalks.ph so that we can help you.